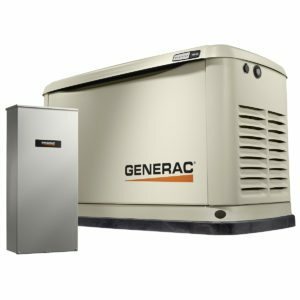 The purchase of a 20kW Generac generator will give you peace of mind for years to come, but it’s a big investment. That is why we want to give you as much information as possible so you can make the right decision based on your needs and budget. Contact us to so we can help you understand how the entire process works, what your financing options are, and how to choose the right backup power solution. One of the most powerful air-cooled generators on the market today, the 20 kW Generac automatic home standby generator can provide whole-house backup power for many homes, when paired with one of Generac’s load shedding devices. Capable of backing up two 5-ton air conditioners. Generac generators and engines are engineered and built in the USA*. 24/7/365 Customer Support Team standing by all day, every day from Generac's headquarters in Wisconsin to answer any questions you might have. Generac's RhinoCoat™ powder-coated finish helps make corrosion-resistant aluminum perfect for all weather conditions.